Slimline aluminium letterboxes with a closed cell foam pad for draught sealing. These letterboxes are often found on slimmer Upvc cross members in a door, where a standard letterbox would prove too large. They are of a full metal construction. 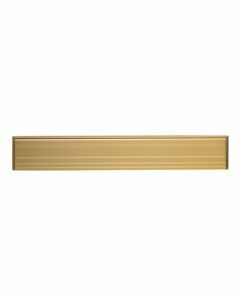 Slimline letterboxes are available in Satin Gold or Silver, sometimes called an anodised finish.